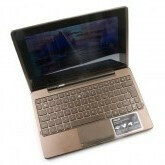 The ASUS Eee Pad Transformer is one of the most wanted crossover products – half-tablet, half-netbook – the Transformer comes with a juicy price tag of only $399 for the basic model. It’s no surprise that shortly after it went on sale it was quickly sold out, but one thing owners of the affordable Transformer might have wanted in addition to the device is a software update. Android 3.1 Honeycomb was confirmed to be coming soon, but impatient geeks can get it now from the download link below.